So why are Seth and Jenn posting a picture of potatoes? Because they aren’t potatoes, nor do they even have any potato in them! 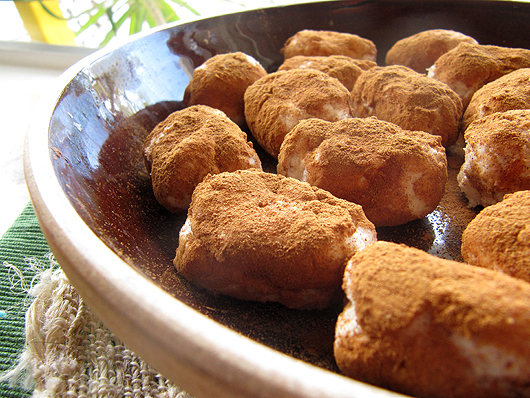 Instead of being starchy tubers, these are super duper sweet confections rolled in cinnamon. This fun trompe l'oeil candy recipe actually comes from my grandmother. She brings out this recipe one time a year, and that day, unsurprisingly, is St. Patrick’s Day! We just love the way these treats play with the senses, looking like a potato and tasting like candy. Cream butter, confectioner’s sugar, coconut flakes, vanilla extract, and marshmallow crème together. If the batter doesn’t come together, add a bit of milk to the mixture. Shape into potatoes. Roll each “potato” in the cinnamon. omg! That looks so delicious!!! I'd heard of these before, but I'd forgotten about them. Thanks for the reminder! What a fun treat for St. Patrick's Day. I agree with Lisa, these would be fun for St. Paddy's Day! Marshmallow and cinnamon-count me in! These do look like a tasty treat. Definitely a new recipe to me. Glad your grandma shared the recipe with you so you can pass it along-yum! Potato fake out! These look yummy and sinful. I am awarding you a Versatile Blogger Award because I'm loving your site and your recipes (especially that heart shaped egg). Awesome work. That's such a cute idea. Great conversation piece for a party. Wonderfully whimsical and cheeky dish. Very fun & creative, in addition to being tasty. My first thought was potatoes with sugar! Until I read your description! I think the kids are gonna LOVE this! Oh, do these sound tasty! Marshmallow creme and coconut??? Yeah, I'd love 'em! I know what these are! My best friend's mom used to make these when we were kids. But, she called them something different that for the life of me I can't remember right now. You have brought me so many memories! Oh these look so good. I've never seen anything like these before, am now following your blog. These do sound yummy, what a tasty filling rolled in cinnamon. Thanks for stopping by and I will be back to visit. Have a great day. I have to try these just for fun. I was totally expecting potatoes! So tricky. From the sounds of it they are delectable! I have seen recipes for these before, but have never seen a picture of them made. What a fun treat and how neat that it's a recipe that you can pass down as a tradition.